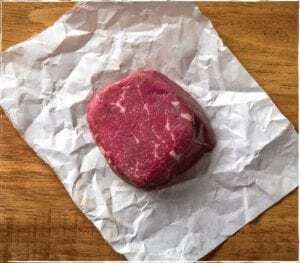 Petite Cut steaks aren’t just our regular steaks cut thinner to get them to a lighter weight. We use beef from smaller cattle so that our Petite Cut steaks are smaller in cross section, which means that even though they are lighter, we can cut them thicker. Thicker steaks always cook better than thin ones. These steaks are cut the way we grew up eating them. They are generous portions, but well balanced in every respect. We keep them no less than 1” thick and in most cases they run closer to 1.5” thick. We cut steaks this way because we believe it achieves the best balance between cook-ability and eat-ability. 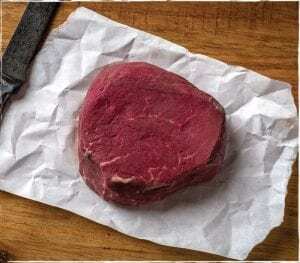 Steaks that are too thin are difficult to cook perfectly, steaks that are thicker require much longer cook times, and bigger appetites. Classic Cut steaks are all about balance. We had to talk the big boss into making these, as they are a little … extravagant … One of our best restaurant customers asked us for some “special steaks” for an event they were hosting. Our butchers cut these epic steaks, and after having a few ourselves, we decided to include them in our standard line up. We don’t sell a lot of these, but if you want a steak that makes a statement, serve a King Cut. 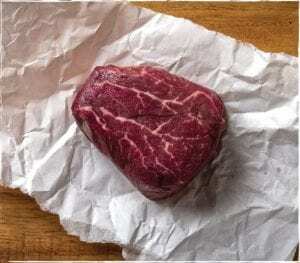 Wagyu Beef – Why all the Fuss?